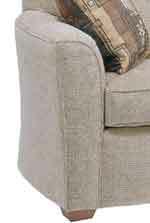 This upholstered swivel glider accents the rest of the collection beautifully. Available in your choice of fabrics, you can create a look that you are sure to love for years to come. Create an intimate seating area with this multifunctional swiveling gliding chair. The Lakewood Kingman Rocking Swivel Gliding Chair by Flexsteel at AHFA in the area. Product availability may vary. Contact us for the most current availability on this product. Seat Back Tight attached seat back. Leg or Skirt Swivel gliding base. Perfect for a lakeside cottage or any cozy space, this collection offers straight lines and a smaller scale to prevent overwhelming a compact room. A tight pulled back and wood block feet complete the look of simplicity and style. Contemporary sofa with flare arms. Shown with matching Kingman chair. The Lakewood collection is a great option if you are looking for Casual furniture in the area. Browse other items in the Lakewood collection from AHFA in the area.